Prime minister Charles Michel met with a delegation of the gilets jaunes, or yellow vests, on Tuesday morning in his office in Brussels. It is not known if the meeting will alter the group’s plans to hold another protest this Saturday in the EU quarter. Following the vandalism and violent clashes with police last week, which led to the arrest of some 80 protesters, the group responded to an invitation to meet with Michel. The meeting took place this morning, though it is not yet known if there were demands or what was said. The yellow vests, so named because of the fluorescent safety vests they wear, have been protesting against high petrol prices and the cost of living in general for more than two weeks. The protest, which crossed the border from France, was taking place daily in Wallonia before moving into Brussels last Friday. No such meeting with leaders in France has taken place, as the group there refused an invitation from prime minister Éduoard Philippe. Members of the protest group in France however – which, like in Belgium, has no named leaders – plan to come to Brussels this Saturday to take part in another action in the EU district. A few event posts on Facebook contain conflicting information, however, about the time and place. While one reads 11.00 at Schuman, another reads 10.00 at Cinquantenaire. Whatever the specifics, it is likely that both French and Belgian yellow vests will take to the EU quarter on Saturday morning. 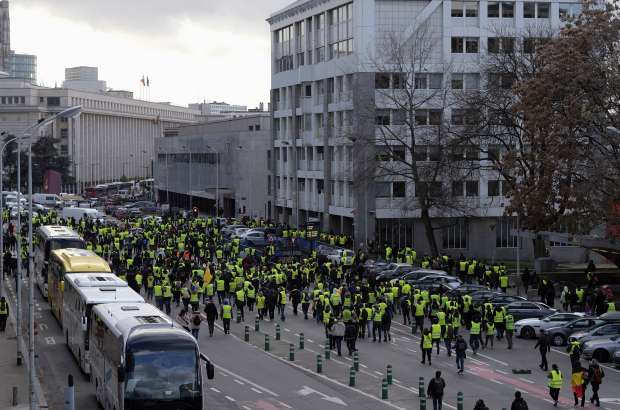 According to reports, farmers and lorry drivers will also join the protest action, which is expected to march down Rue de la Loi. No official request for a permit to march has been submitted, however, according to the Brussels-City-Ixelles police zone. Not another giant car park shituation!